Peel and grate potatoes using coarse side of the grater. Tranfser shredded potato to a fine sieve and set aside for approx. 20 min. Peel and finely dice shallots. Press on potatoes to squeeze out any remaining liquid. Add potatoes and shallots to large bowl with eggs, flour, salt, and pepper. Mix carefully until fully combined. Heat sunflower oil in frying pan over medium-high heat. Add potato mixture 1 tbsp. 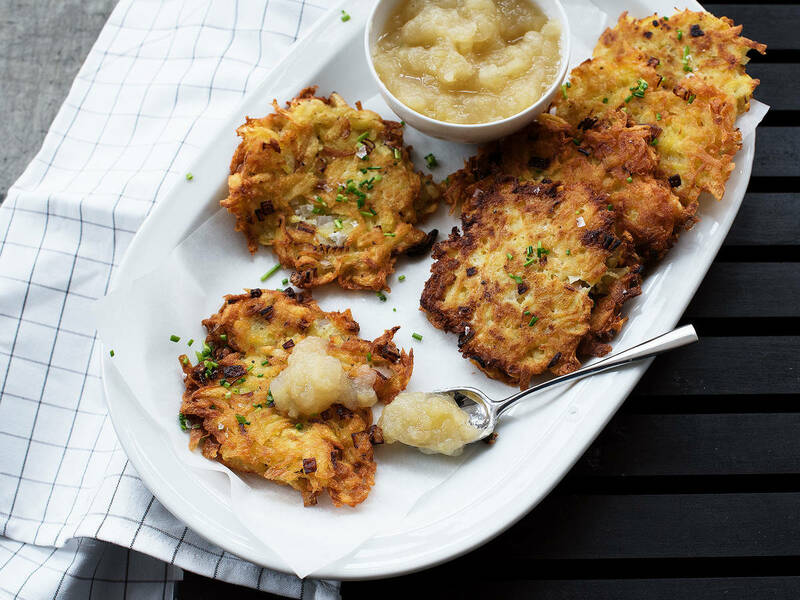 at a time to pan and press down to make latke approx. 1 cm/ 0.5 in.-thick. Fry on both sides fro approx. 5 min., or until golden brown. Transfer to a paper towel-lined plate and serve warm with applesauce. Enjoy!